After nursing Nathan and Benjamin back to health during November, I spent almost the entire month of December sick. Every time I'd start to feel better, I'd come down with all new, miserable symptoms. I had some high hopes for this December, especially because we had nothing major planned in the way of travel or huge time obligations. I thought it would be the perfect time to pull out all the crafting supplies and maybe do some baking with the boys. Instead, it was a month of Michael wrapping up loose ends on one project while at the same time he jumped into a new project, and volunteered what little free time he had on another project. This translated into a month of the boys and I not really seeing Michael at all! Without him around to help, I didn't have the time or energy to do anything other than hold the bare minimum together. I made sure the boys ate, had clean clothes to wear, and that the bathroom was clean. Which actually wasn't that easy to do since we finally had the contractor here to fix the bathrooms! The worst part was feeling sick and miserable and wanting to climb into bed and sleep all day while the boys were at school, but having a house full of workers and NOT wanting to climb into bed and sleep while they were here. So I sat on the couch, dazed and confused. The boys would come home from school just about the time the contractors would leave, and I would sit at the table, dazed and confused, trying to supervise homework. I have never been so grateful for dusk falling so early, giving me an excuse to get the boys in bed far earlier than normal so that I could climb into bed immediately after, and sleep until Michael got home at one or two a.m. The one responsibility I could not shirk was that of planning and running the party for Benjamin's first grade class. Room Moms have three things they are responsible for: the Holiday Party, Teacher Appreciation Week, and the end of the year Park Day Party. The Holiday Party really sets the tone for the rest of the year, and as a volunteer, nothing frustrates me more than chaos! When people give up their time (and possibly a work day) to come and be in the classroom, I want everything to be very clear and free of frustration. I know things always go haywire when dealing with a group of 24 first graders, but I want to remove any of the frustrations that are possible to plan for! After all, if you can make it easy for the volunteers early in the year, then it is far more likely that come the last weeks of school you'll have plenty of volunteers for the Park Day Party when the kids are wily and wiggly and ready for Summer Vacation and you really need lots of volunteers! 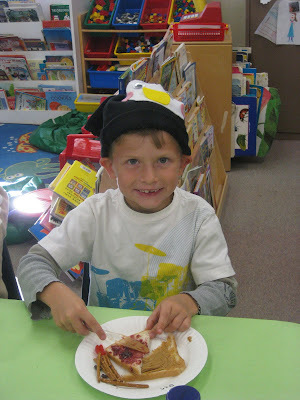 So I managed to pull together every last drop of energy I had and made Benjamin's class party flow easily and smoothly, with lots of clear directions, tons of fun activities with ample supplies, and a noticeable lack of chaos! It helps that Ben's teacher this year is incredibly well-organized and has her classroom tightly under control. I'm a huge fan of hers! 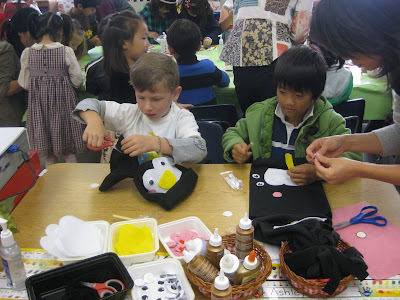 One of the activities was a fleece penguin hat. Another mother sewed up some black fleece into tubes, which the kids decorated with felt faces and googly eyes, then tied a string to gather it up and cut fringe into the top. Ben wore his most of Winter Break! I love classroom crafts that are original and don't just come out of the craft kits at Oriental Trading Company. But that's just me. Allergies, especially allergies to tree nuts and legumes like peanuts, are becoming more and more severe and prevalent. The boys' school has designated "Peanut-free" tables in the cafeteria to help the kids who have the most severe reactions. But (surprisingly) the kids in Ben's class are totally allergy free! 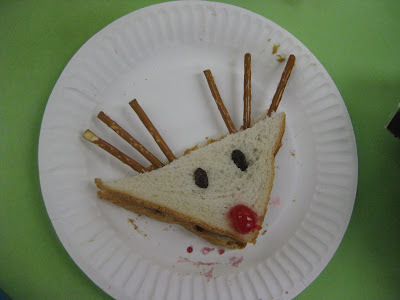 Which meant we could put together these sweet Rudolf sandwiches. One slice of bread, peanut butter, jelly, pretzel antlers, raisin eyes, and half a maraschino cherry for the bright red nose. We had many other activities as well, including a wrapped book exchange. The kids all held the wrapped book they brought on their laps and sat in a circle. One of the fathers read 'Twas the Night Before Christmas, and each time he said the word THE, the students would pass their book to the right. It was fun for the kids, and funny for the parents who watched. As soon as the day was over and the final bell rang, the boys and I walked home from school. I put on the movie Elf and let them go through their ample holiday loot (their classmates gave them things like movies, books, calenders, personalized stockings, and of course, tons of candy), while I climbed into bed and slept until they woke me up wanting dinner instead of just sweets. I guess I partied just a little too hard!